You are currently browsing the The Pet Product Guru blog archives for the day Monday, January 14th, 2019. Small Dog Leaps Could Be Dangerous! If you have a small dog, he may jump up into your lap. 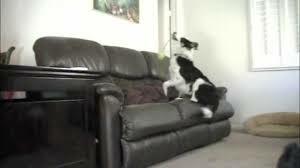 Letting him jump on the furniture is a bad idea. Not only does it make house keeping difficult, but it could be tough on your pets joints and cause an unexpected injury, especially in puppies or older dogs. I once had a small dog who took a leap off of a staircase and injured his legs. If was obvious he was in pain but luckily no bones were broken. If you want to cuddle with your dog, pick him up and place him gently in your lap. You can also buy a set of pet stairs to help him climb to high places. Scaling stairs too often can cause stress too so make sure to buy a set of stairs that’s not too high or wide for your dog. Remember to keep an eye on your dog when he’s up high. You don’t want him to fall and hurt himself. The greatest oldies of your life are playing right now on Edgewater Gold Radio! Oldies from the 50s 60s 70s and 80s have been playing for 17 years are we are still going strong! You may download the free Edgewater Gold Radio app from your app store or listen from our website: Edgewatergoldradio.com. add comment Comments Off on Small Dog Leaps Could Be Dangerous!